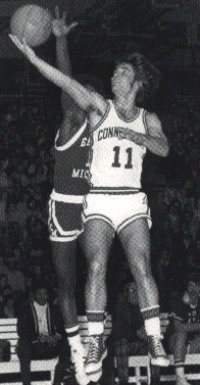 Joe Whelton was a Guard for the UConn Huskies from 1974 -1978. He’s a member of the UConn Basketball All Century Ballot, and has been a Head Basketball Coach in Europe for many years. I had the pleasure of talking with Joe by phone in Germany during May 2004 when he shared some United States basketball, and European coaching experiences. When Joe went to high school at East Catholic, he had a great basketball coach, Stan Ogrodnik, who taught basketball skills and discipline. During Joe’s sophomore year in high school he was a starter for the Varsity Basketball Team, and they won the Class A Championship. The championship game was held at UConn. It was Joe’s first time visiting UConn, although growing up he always listened to UConn basketball on the radio. East Catholic always had winning seasons, and was a well respected basketball program in the state. Joe was a starting guard for three years, and was a member of the first team Class A All State Team his junior and senior years. Joe received lots of letters from colleges interested in him, but Joe was close to his family, he was an East Hartford kid who hadn’t traveled much, so he narrowed his selection to schools in the east, UConn, Fairfield University, Providence College and Boston College. UConn had begun recruiting Joe in his junior year of high school. Joe was comfortable visiting UConn, the Hartford Civic Center had just been built, which was a dream come true, and to be able to play at UConn, in the HCC, a five minute ride from where he grew up, so he chose UConn as the college to attend. The experience at UConn was exciting. There wasn’t the exposure there is now, there was no ESPN, and few games were televised. Coach Dee Rowe and his staff tried to get the best players from Connecticut like Al Westin, Tony Hanson, Joe and later Jim Abromaitis and Randy LaVigne to stay in CT, so it became sort of a state pride to get recruited, and play at UConn. Some highlights at UConn for Joe were when he was a sophomore, and the team went to the National Collegiate Athletic Association Sweet Sixteen. In doing that, they had to win the New England Championship Tournament. Joe had made a shot with three seconds to go, to win a game against UMass during the tournament. The next night they badly beat Providence College who was a top 20 ranked team, and UConn destroyed them. Joe had received Most Valuable Player Honors for the tournament. The team Joe coached his first year in England was bought buy a major soccer team, Manchester United, one of the most famous soccer teams in the world. He was soon hanging around with soccer players, and coaches, and management as they traveled all over Europe with his basketball team playing in Rio, Madrid and Barcelona. They won two championships, and The Cup of England once, and they represented England in the European Cup Tournament. Joe coached that team for five years then had an offer to coach in Switzerland. He also coached the Great Britain Olympic Team in 1988. His team did a great job coming in sixth place in Europe, but they had to finish in the top four to qualify for the Olympics. Moving on to Switzerland, the first team Joe coached was in Fribourg. He was with that team for four years and they won a championship once. Then he moved on to Belizean, Switzerland and won three championships and four Swiss Cups during his four years there. Next came Germany where Joe has been for the last seven years. The German League was a higher level of basketball, new arenas were being built, television contracts were being worked out, and a lot of good American players from the Athletic Coast Conference and Big East were coming to Germany to play. For four years in Germany Joe was with a program he had built in the city of Giessen. Then he was offered a contract for the team Trier to build a basketball program. He’s in his first season with TBB-Trier, and by European standards they are doing very well getting 6,000 fans per game. When I spoke to Joe his team was in the quarterfinals of the playoffs. There are sixteen teams in his division, his team is ranked number seven, and they were playing number two. Before Joe was head coach for TBB-Trier, last year, TBB-Trier finished in last place. 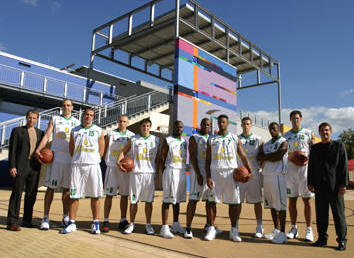 This year the team created a lot of excitement, and it was a success no matter if they won in the quarterfinals or not. Joe’s thoughts on UConn having won their second National Championship: “I was so happy they won another championship. I had a good feeling that this was going to be their year again.” Joe has known Coach Calhoun since he was a high school player. Coach Calhoun used to speak at basketball camps Joe attended. Joe’s thoughts on the 2004-2005 season are that Coach Calhoun is going to build his program back up again. They are going to have a target on their back as the National Champions; everyone is going to play their best to beat UConn. He said it will be a learning experience for some of the players, and he thinks in a few years UConn will be back at the Final Four. Joe said that he has been blessed because his high school coach Stan Ogrodnik and college coach Dee Rowe are two of his closest friends. Coach Ogrodnik was well disciplined; he got the most out of each player. With Coach Rowe, you learned how to play a fast paced almost NBA type of game. “Both those guys helped to formulate my philosophy basketball wise, and off the court.” Having lived in Europe for 20 years, Joe often thinks back to those experiences. Joe has two daughters, Jamie who is almost 21, and Jessica age 17, who have been going to school in the United States for the past two years. They both speak four languages, and until last year, have always lived in Europe with Joe, but have come to the United States on vacations every summer. Joe’s wife, Magda, is from Italy, and they have a 3 ½ year old son Matteo (Italian for Mathew). Matteo currently attends Joe’s games with a basketball headband on, and always wears a shirt that says Whelton #11 on the back.